This issue sees the start of the “Captain America and the Falcon” period of the first volume of Captain America, lasting until issue #222 in June 1978, and appropriately it features Cap helping Sam with a personal case in Harlem (and, in general, it befits the increasingly social aware direction of the title that began in the late 1960s). Note: In keeping with the official indicia, Marvel.com, and the Marvel Database, I will refer to these issues as simply Captain America, but this is not to deny in any way the important role that Sam plays in them. The opening splash and the top of page 2 set the tone for the issues to come, emphasizing the focus on Cap and Falcon’s new partnership, as solidified in the last issue. Of course, this wouldn’t be a Marvel comic if this comfortable bonhomie lasted for long, but it’s mighty nice to see while it lasts. Our story proper starts when Sam Wilson, social worker, gets a visit at his office from his nephew, who’s involved with the same Stone-Face whose thugs Sam and Cap were fighting at the start of the issue. Steve literally runs into Jody outside Sam’s office, and after being briefed by Sam, thankfully acknowledges that they shouldn’t use the kid to get at Stone-Face (though they were both thinking it). When Jody gets “nabbed” after shaking down a local merchant, Cap steps in as a character reference, although the judge is already familiar with Jody’s favorite uncle. Jody gets his first taste of the illusion of “honor among thieves,” until he imagines that Stone-Face actually got Cap to appear in court. Unfortunately, he confuses the judge’s leniency for being bulletproof, while Stone-Face has an distinctly different way of looking at the outcome. After Cap and Sam catch up with the ne’er-do-wells, they find cover from gunfire beneath the balcony the thugs are on, and Cap finds a new use for his mighty shield (and manages to slip in a “son” and an “ol’ man” for good measure). Below, Cap makes a surprising quip about “breaking in new partners,” which we could read as suggesting he’s getting over his guilt over losing Bucky (which has prevented him from accepting Sharon’s work with S.H.I.E.L.D.). As if “son” and “ol’ man” weren’t enough, Cap shows his old-fashioned side again below. After the bad guys have been defeated and handed over to the police, Sam sits down with Jody and his mother, but I don’t know if Jody’s “revelation” would satisfy either of the adults in the room. I don’t think that’s the only problem with “small crimes,” but I guess it’s a start! Finally, Cap and Sam have a heart-to-heart, acknowledging the hard spot kids like Jody find themselves in, with few reliable authority figures or institutions to reach out to, and reasserting the need for justice, tolerance, and understanding to combat racial tension and other forms of hate. 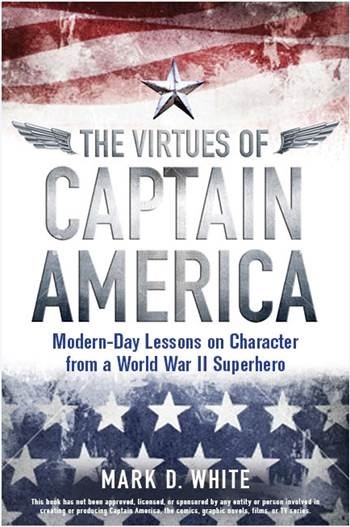 It’s also nice to see Cap affirming a more practical and specific mission, helping at-risk kids and fighting hatred, which helps combat his image as a symbol of the American Dream in the abstract—which is valuable also, but needs fleshed out to be put into practice, like all ideals and virtues.